Everyone loves re-purposing old things into better-looking items. And of course, who doesn't love a well decorated patio?! 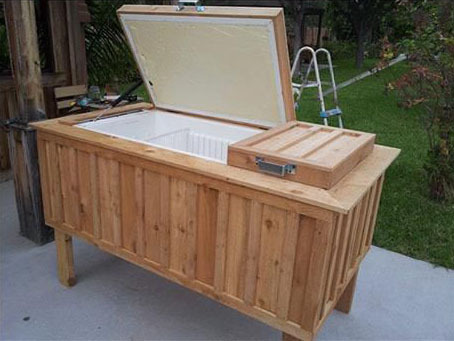 This DIY lets you turn an old refrigerator into a beautiful ice chest at an affordable cost. The first step you should take to turn your old, run down fridge into an awesome ice chest is to remove all of the accessories that make it run. Be sure to remove the evaporator cell and fan, the compressor, the condenser fan, shelves and drawers, and any other unnecessary items that will take up space in what will be the ice chest. After you are done removing the unneeded pieces, you can start creating the design. Then put the fridge on its back and start making measurements. Start from one side of the fridge and measure the center line running the length. After this, measure the center line of the top and bottom halves. Screw a 2" x 1/4" slat in the length of the top and bottom halves using #3 screws in the center and 6 inches from each end. Then take 4" x 1/4" slats, cut to the height of your soon-to-be ice chest, and screw them into the 2" x 1/4" slats using two #3 screws for the top slat and three screws for the bottom slat. Be sure the top and bottom of the fridge are decorated the same. Then do the same for the doors that once belonged to the freezer and fridge sections. Drill a hole in what was the back of the fridge (what is now the bottom of your ice chest) and insert a plug so you can drain water later on.You can also create legs and a support for your new ice chest. The design is up to you and what you think would go best for your patio or in your back yard. Now just put your awesome ice chest where you want it and fill it with ice! You can also use hinges to make the doors stay open so you can take things out, it depends on your preference. Personally, I would use hydraulic openers, which open and close softly. Awesome, I'm so glad to hear that! If you email me photos I can put them on here and link you, that might be cool. Isn't there any way to make this work as a regular deep freeze without adding all the ice? what is that thing sitting on the top that looks like a tray or drawer of some kind? That thing sitting on top is what used to be the freezer door !!! Dry ice? Liquid nitrogen? Would most likely work for a freezer temporarily. I have an older stand up freezer...would that work for this? Do away with the ribbon background can not read the institutions. Have the ice chest done. What an awesome idea. Now just trying to figure out what to use for the hinge to hold lid open. Any suggestions would be appreciated. I built one as well, worried about door slamming on kids hands, toying with the idea of weight and pulley to prevent the door slamming closed. Any ideas??? This is one of the oldest fridge. At present there are numerous brand out in the market that offers best range of refrigerators. I haven't found any ideas for the hinges to keep from slamming, But a smaller matching case for a regular cooler is what we use for the kid drinks. We tell everyone the Ice Box is for the "grown up" drinks and its a little higher so the kids can't reach in. Use toy box hinges, they lock in place so little hands don't get hurt. I'm sure you could find a heavy duty kind at your local Lowes or Home Depot. I would suggest one on each side for extra strength, depending on the weight of the door and added covering. I really like the idea of recycling the old fridge, but I would strongly sugest a second handle be added on the outer rail to secure a lock on it. It could save a child's life as they like to climb in and could be trapped inside. When someone is given the task of making research upon specific topic and then write it without any grammar or spelling mistake as well as present it professionally then it is very difficult for those people don't know how to research and write. Don't worry because essay writers available at http://www.essayspresident.com/ this website who are providing you appreciative writing and researching services at low cost. You should proofread your advertisement for grammar and spelling! I have an old outdoor rated frig in black and stainless so I decided I would use it as is without all the wood etc... however, it was my hope to use the old freezer compartment for a cooler and the frig portion to store BBQ supplies... but alas, it takes on water when it rains , snows, etc... any ideas how I can avoid that ? Did you plug the fan areas? If so how. I have an older fridge, probably 80's and there will be holes from ice maker water hose and like I said where the fans are. Thanks in advance. Ps awesome idea! The doors on my fridge have cardboard over the insulation. Looks a little rough. Would taking the foam insulation out of the doors have a major impact on the overall cooling? if you're going to provide commercially prepared items, you need to have an concept of how much extensive range you want to have and how many of these you think you can provide in a day. Have you ever taken foods out of your fridge only to discover that it's protected in ice gems, stained, and has places on its area that appear run out or leathery? If so, you've seen the effects of fridge get rid of first hand. Really great blog. . Your work is really being appreciated by Appliances on Rent. Hi - Karina - this makes me nervous because of the Refrigerator Safety Act. Maybe it should lock so that stray neighbourhood kids can't get in and suffocate? The issue is the heaviness of the doors. This is a very beautiful creation. The question of children getting into the refrigerator and getting trapped is a valid concern. As Karina noted, she has added legs to make it higher to keep the children out; it would not be a bad idea to have a locking mechanism on it. However, it would have to be pleasing to the eye. Does any one have any suggestions? Good ideas.I like the idea of recycling the old fridge.Thanks for sharing.I will have a try! Very cool idea to upgrade your old refrigerator. Make sure your refrigerator still working fine before creating a new ice chest. Sometimes, our refrigerator are just plain in color, in addition try to re-paint it to make it nice standing work of art. Awesome idea. I am currently working on mine. Should be done in a few days. I wish I would have found this sooner though, mine is based off a photo of the finished product, had no direction. So mine will not be lifted more than enough to attach wheels to the backside of the refrigerator. But I wrapped mine in seasoned,weathered cedar. Very proud of it so far. Here you find out the Ice Chest Reviews based on their features and types like rotomolded design, Portable Coolers, bear-proof coolers etc. Find Exclusive Deals On Portable Fridges Freezers, High Performance Cooler, High Performance Cooler in Canada, Portable Fridge Freezers in Canada, Heavy Duty Cooler in USA, Rotomolded Cooler in USA, and Rotomolded Cooler etc.